We begin the week with another new series produced by students at University of Maryland Baltimore County (UMBC). A recent project at UMBC has been collecting stories of Baltimore communities as they change and grow. The idea is to meet people where they are and listen to their stories. It’s called Baltimore Traces: Communities in Transition and it’s made possible by a Hrabowski Innovation Fund grant. This semester’s radio series is called DOWNTOWN VOICES. Students talk to city folks about their thought on the past, present, and future of Baltimore. 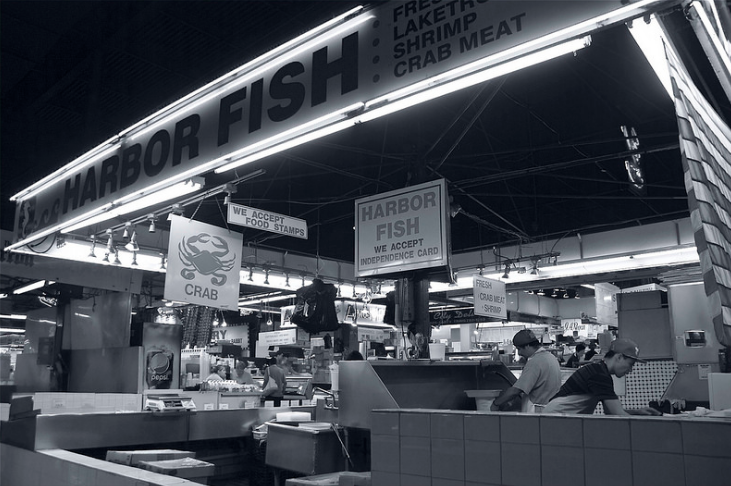 Today, “A Tale of Two Markets,” — a look at changes in our city through the lens of the old and beloved Lexington Market, and the new and hip Mount Vernon Marketplace. This story is narrated by Adam Droneburg, of UMBC’s Baltimore Traces.